Want Better Results in a VA C&P Exam? Paint a picture. Far too many veterans approach their VA C&P exam like it’s a hearing or a trial. The result of this is that the VA C&P examiner acts like a lawyer and defends the VA’s position. In other words, you get an adverse – and very legalistic – VA C&P exam opinion. Are you ready to experience different results in your VA C&P exam? If so, then this post is just for you. The tips and strategies in this post center on a common theme: If you want better results in your VA C&P exam, don’t lecture the examiner. Paint a picture of how your disability affects you. By the way, this is the third post in a 3-part series offering tips an strategies for having a better experience in a VA C&P exam. You can read the first set of tips by clicking here, or click here and read second set of tips. 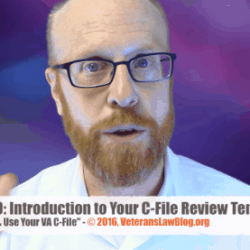 Tip #7: Know What is “At Issue” in the VA C&P Exam. In earlier tips, I told you to talk only about symptoms and limitations, or if you had to, have a brief statement (20 seconds and 1 sentence) that explains why you think your condition is service connected. But this begs the question – how do you know what is going to be discussed in your VA C&P Exam? This comes back to knowing the 4 Pillars of a VA claim. If you don’t understand these 4 pillars, and how to prove service connection to the VA, you will struggle in your VA C&P exam and likely get poor results. I’ve prepared an entire video training course for you to learn everything you need to know about proving VA service connection – I recommend you start learning there. You can read about all 4 Pillars by clicking here. Your VA C&P exam will invariably involve issues in only 2 of those pillars: diagnosis (Pillar 2), nexus (Pillar 2), or impairment rating (Pillar 3). If your exam is for a condition that has not been service connected, there is a good chance that it is either a “nexus” exam or a “diagnostic exam”. Let’s talk about the diagnostic exam. Remember that the VA has a Duty to Assist? While I tell veterans all the time not to confuse the “Duty to Assist” with “Actual Assistance”, there is one scenario where I think the VA does a good job of assisting Veterans in their claims. That scenario arises if you have not yet had your medical condition diagnosed – in certain situations, the VA is required to send you for a diagnostic C&P exam to diagnose your medical condition before a decision can be made about service-connection or impairment rating. If, however, there is no reasonable possibility that the condition could be service-connected even if diagnosed, the VA does NOT have to send you for a diagnostic C&P exam. If your exam is not a diagnostic C&P exam, then you can be sure that the doctor will want to talk to you about “nexus” and the “impairment rating” criteria. So here’s what you should do – first, prepare your brief statement as to why you think your condition is related to military service – keep it short and sweet (see Post #1 for a great example) and remember that the goal is to force the Examiner into the C-File to study your medical and military service records. Next, look up the rating criteria in 38 CFR Table 4 to determine what factors the doctor will want to know when deciding on your rating percentage. Click here to learn how to find out what your Impairment Rating criteria are. Focus on these symptoms and limitations in your discussion. Lastly, if you have enough time before your exam, prepare a summary of your medical records for the doctor to review – even if he or she already has the C-File in front of them. 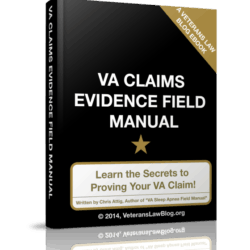 I explain exactly how to do this in my Training package – How to File a VA Claim. In that video, I will teach you how to assemble and organize the medical evidence that proves your claim for service connection by using my unique “VA Claim Map“. It’s not hard to do, and it will help you keep your claim organized. Many doctors have really appreciated the summary of the claim that we sometimes send with our clients to C&P Exams. Tip #8: When you talk about your condition, paint a picture. When I tell my clients this tip, I tell them to think “Toilet Bowls”. I had a client that was going in for a VA C&P Exam to re-evaluate the impairment rating on his knee condition. The prior VA C&P doctors had never considered the “instability” in his knee joint when low-balling his rating in the past. So we knew this exam would focus on the instability of the Veteran’s knee. In our prep for the C&P Exam, I asked my client to describe his knee instability. Here’s the story he told me. That story is particularly effective in describing problems with knee stability. Because the veteran painted a picture that used a toilet bowl. Nobody can easily forget that kind of visual images. Now, I’m not saying to describe all your symptoms using a “Toilet Bowl” example – what I am saying is that you should paint a picture for the examiner of how the symptoms affect your daily life and work activities. Don’t state symptoms. Paint a picture of how they impact your daily living – especially in your home, social and work lives. But be careful, though – don’t embellish. Everyone can spot someone engaging in self-serving hyperbole or exaggeration (you know the type – in the military we called them “Bulls**t Artists”). Just describe the problems your symptoms are giving you in your daily living and working activities by painting a picture of when and how often they surface. I’ve shared this tip before – when the exam is done, ask the Doctor for his/her business card – or just their name if you can. Be friendly about it – not confrontational. Why do you want to do this? Because the Veterans Court has said that unless you challenge a doctor’s credentials, you are allowing the VA to presume that they doctor was competent and the exam was adequate. So, get the doc’s name. Then read up on how to challenge the doctor’s credentials in a Notice of Disagreement if your VA &P Exam comes back adverse or negative. And then – I cannot stress this enough – get a copy of the C&P Exam. Before the Ratings Decision comes out, if you can. Here’s how to go about getting a copy of the C&P Exam using the Freedom of Information Act (FOIA). Tip #10: After the VA C&P Exam – Write Down your Notes. A growing issue in the arena of veterans benefits is the adequacy of the exams that VA C&P Examiners provide. You may not have a lawyer now, but if you do someday, it will be incredibly helpful to your attorney to know the step-by-step process of what happened in your VA C&P Exam. This is particularly true in a VA C&P Exam to rate a knee injury: the doctor must consider so many things (range of motion, instability, functional loss, pain, flareups, and more) that knowing what the doctor did and did not ask you to do during a VA C&P exam can be critical to challenging it later. What tests did the Doctor perform? What questions did he ask? Did she use any tools or instruments to take any measurements? After you leave your exam, take 20 minutes, sit down, and write – to the best of your recollection – a step by step of what happened in the exam. Doesn’t need to be perfect. Doesn’t need to have every word. Just enough for someone to look at later and assess whether the tests that the Doctor did – if they did any at all – were adequate to achieve the purposes of the exam. Just write the key facts of what happened, what was measured, and what tests were performed. If you are feeling particularly lawyerly, type your notes into a Sworn Declaration like this one, and sign and date it the day of the exam. Tuck it away in your records and then, if your attorney or representative needs it later, you have a document contemporaneous to the exam that discusses what happened and didn’t happen. 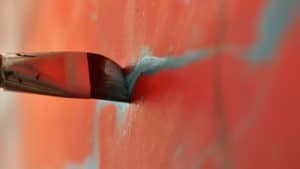 This will make your statements about the inadequacy of the exam years down the road far more credible – because they weren’t blurred by time or memory bias. I hope this tips and pointers helped. If you have questions or other ideas, leave them in the comment section below. Use of this content without the express and written consent of Chris Attig is forbidden.